"Mock Tudor" redirects here. For the Richard Thompson album, see Mock Tudor (album). Tudorbethan is a subset of Tudor Revival architecture which eliminated some of the more complex aspects of Jacobethan in favor of more domestic styles of "Merrie England", which were cosier and quaint. It was associated with the Arts and Crafts Movement. The emphasis was on the simple, rustic, and the less impressive aspects of Tudor architecture, imitating in this way medieval cottages or country houses. Although the style follows these more modest characteristics, items such as steeply pitched-roofs, half-timbering often infilled with herringbone brickwork, tall mullioned windows, high chimneys, jettied (overhanging) first floors above pillared porches, dormer windows supported by consoles, and even at times thatched roofs, gave Tudor Revival its more striking effects. It is also quite expensive. The Tudor Revival style was a reaction to the ornate Victorian Gothic Revival of the second half of the 19th century. Rejecting mass production that was introduced by industry at that time, the Arts and Crafts movement, closely related to Tudorbethan, drew on simple design inherent in aspects of its more ancient styles, Tudor, Elizabethan and Jacobean. The Tudor style made one of its first appearances in Britain at Cragside, a hilltop mansion of eclectic architectural styles that incorporated certain Tudor features; Cragside was designed by the architect Norman Shaw. However at approximately the same time, Shaw also designed Leyswood near Withyham in Sussex, which was a large mansion around a courtyard, complete with mock battlements, towers, half-timbered upper facades and tall chimneys – all features quite readily associated with Tudor architecture; in Shaw's hands, this less fantastical style achieved immediate maturity. Confusingly, it was then promptly named "Queen Anne style", when in reality it combined a revival of Elizabethan and Jacobean design details including mullioned and oriel windows. The style later began to incorporate the classic pre-Georgian features that are generally understood to represent "Queen Anne" in Britain. The term "Queen Anne" for this style of architecture tends to be more commonly used in the USA than in Britain. In the USA it evolved into a form of architecture not instantly recognisable as that constructed in either the Tudor or Queen Anne period. In Britain the style remained closer to its Tudor roots. 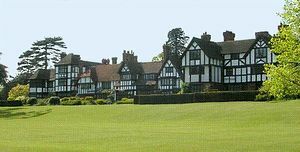 Tudorbethan represents a subset of Tudor Revival architecture; the word is modelled on John Betjeman's 1933 coinage of the "Jacobethan" style, which he used to describe the grand mixed revival style of circa 1835–1885 that had been called things like "Free English Renaissance". This was generally modelled on the grand prodigy houses built by the courtiers of Elizabeth I and James VI. "Tudorbethan" took it a step further, eliminated the hexagonal or many-faceted towers and mock battlements of Jacobethan, and applied the more domestic styles of "Merrie England", which were cosier and quaint. It was associated with the Arts and Crafts Movement. Outside North America, Tudorbethan is also used synonymously with Tudor Revival and mock Tudor. From the 1880s onwards, Tudor Revival concentrated more on the simple but quaintly picturesque Elizabethan cottage, rather than the brick and battlemented splendours of Hampton Court or Compton Wynyates. Large and small houses alike with half-timbering in their upper storeys and gables were completed with tall ornamental chimneys, in what was originally a simple cottage style. It was here that the influences of the arts and crafts movement became apparent. However, Tudor Revival cannot really be likened to the timber-framed structures of the originals, in which the frame supported the whole weight of the house. Their modern counterparts consist of bricks or blocks of various materials, stucco, or even simple studwall framing, with a lookalike "frame" of thin boards added on the outside to mimic the earlier functional and structural weight-bearing heavy timbers. An example of this is the "simple cottage" style of Ascott House in Buckinghamshire. This was designed by Devey for the Rothschild family, who were among the earliest patrons and promoters of this style. Some more enlightened landlords at this time became more aware of the needs for proper sanitation and housing for their employees, and some estate villages were rebuilt to resemble what was thought to be an idyllic Elizabethan village, often grouped around a village green and pond; Mentmore in Buckinghamshire is an example of this. The Tudor Revival, though, now concentrated on the picturesque. A very well-known example of the idealised half-timbered style is Liberty & Co. department store in London, which was built in the style of a vast half-timbered Tudor mansion. The store specialised, among other goods, in fabrics and furnishings by the leading designers of the Arts and Crafts movement. In the early part of the century, one of the exponents who developed the style further was Edwin Lutyens (1864–1944). At The Deanery in Berkshire, 1899, (right), where the client was the editor of the influential magazine Country Life, details like the openwork brick balustrade, the many-paned oriel window and facetted staircase tower, the shadowed windows under the eaves, or the prominent clustered chimneys were conventional Tudor Revival borrowings, some of which Lutyens was to remake in his own style, that already predominates in the dark recessed entryway, the confident massing, and his signature semi-circular terrace steps. This is Tudorbethan at its best, free in ground plan, stripped of cuteness, yet warmly vernacular in effect, familiar though new, eminently liveable. An example of Tudorbethan architecture was that seen at Greaves Hall, which was built in 1900 as a mansion house for the Scarisbrick family. Many of the features of the original building could still be seen until it was demolished in 2009. 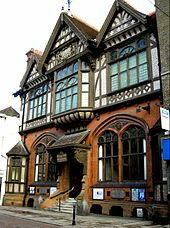 Later came Mackay Hugh Baillie Scott (1865–1945) and Blair Imrie who made their names as Tudor style architects. Lutyens though took the style away from what is generally understood as Tudor Revival creating a further highly personalised style of his own. His buildings coupled with their often accompanying gardens by Gertrude Jekyll, while in a style thought of as "olde world" would not be recognisable to inhabitants of the 16th century. Following the First World War many London outer suburbs had developments of houses in the style, all reflecting the taste for nostalgia for rural values. It was also copied in many areas of the world, including the United States and Canada. New York City suburbs such as Westchester County, New York and Englewood and Teaneck, New Jersey feature particularly dense concentrations of Tudor Revival construction from this period. And daren't look up and see the stars. The late 20th century has seen a change in the faithfulness of emulation of the style, since in a modern development it is common to have only a few basic floor plans for buildings, these combined with variations in interior surface treatment and in the exterior in rooflines and setbacks to provide a visual variety to the street view. Owing to the smaller lots employed in modern developments (especially in the Western US), Tudor Revival may be placed directly next to an unrelated style such as French or Italian Provincial, resulting in an eclectic mix. The interiors of the Tudor style building have evolved considerably along with the style, often becoming truer to the replicated era than were the first examples of the revival style. At Ascott House, Devey's great masterpiece constructed throughout the last twenty years of the 19th century, the only internal concessions to the Tudor age are the low ceilings necessitated through the external Tudor theme. There are certainly no beam ceilings, low narrow doorways or inglenook fireplaces heating small rooms: the large airy rooms are in fact more redolent of the 18th century than the 16th. Cragside is slightly more true to its theme, although the rooms are very large, some contain Tudor style panelling, and the dining room contains are monumental inglenook, but this is more in the style of Italian renaissance meets Camelot than Tudor. While in the cottages at Mentmore the interiors are no different from those of any lower middle-class Victorian small household. In some of the larger Tudor style houses the Tudor great hall would be suggested by the reception hall, often furnished as a sitting or dining room. Large wooden staircases of several flights were often prominently positioned, based on Jacobean prototypes. It is this mingling of styles that has led to the term Jacobethan which resulted in houses such as Harlaxton Manor which bore little if any resemblance to a building from either period. More often it is in the Tudor style houses of the very early 20th century that a greater devotion to the Tudor period is found, with appropriate interior layout, albeit coupled with modern-day comforts. This can be seen in older upscale neighborhoods where the lots are sufficiently large to allow the house to have an individual presence, despite variations in the style of neighboring houses. Whether of older or recent origin, the appearance of solid beams and half timbered exterior walls is only superficial. Artificially aged and blackened beams are constructed from light wood, bear no loads, and are attached to ceilings and walls purely for decoration, while artificial flames leap from wrought iron fire-dogs in an inglenook often a third of the size of the room in which they are situated. Many British builders include variations on Tudorbethan in the range of styles they draw on, and the style tends to be associated with pastiche. Architects are rarely requested to work in the style, and though current postmodern architecture includes a much wider range of styles than the modernism associated with the mid-20th century, few architects are known for buildings which could be called "Tudorbethan". 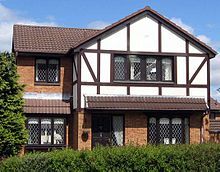 In modern structures, usually on estates of private houses, a half-timbered appearance is obtained by applied decorative features over the "real" structure, typically wood stud framing or concrete block masonry. A combination of boards and stucco is applied to obtain the desired appearance, here seen in the upper image to the right. To minimise maintenance, the "boards" are now commonly made of uPVCFaux Wood, plastic or fibre reinforced cement siding with a dark brown or wood effect finish. In the United States, the style is often further modified by painting the timbers colors such as blue or green. The Tudor Revival style was most popular for new American homes in the 1970s and '80s. Today, it is rarely considered for residential construction in that country as Italian, Mediterranean, and French villa style homes have superseded them in popularity. ^ "5 Sweet Southern Westchester Neighborhoods To Explore". Westchester Magazine. Retrieved December 22, 2018. Wikimedia Commons has media related to Tudor Revival architecture and Tudorbethan architecture.